Cereal is considered a valid meal choice at any time of the day in our house. My girl had a bowl of Special K Protein for dessert last night! The one thing we don't agree on is the milk to cereal ratio. I lean towards dry and crunchy, and my four year old favours her cereal with more milk than crunch (aka soggy). Hubs would score in somewhere in the middle with his cereal to milk ratio. Kellogg's Canada is inviting Canadians to join the debate. We invite you to use Instagram, Pinterest, or tweet about your own #cerealandmilk habits. Don't forget to enter my giveaway too. 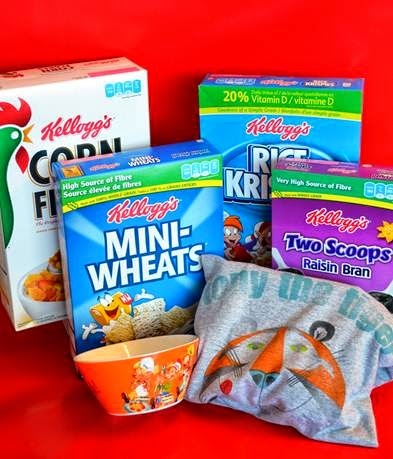 Kellogg's Canada has sponsored 30 bloggers to give away this prize pack of cereal and fun retro looking items. PIN me and share your pinterest name to get extra entries! Disclosure: As a member of the Kellogg Canada blogger community I receive occasional perks. You may enter on multiple blogs, but only win one prize pack from this #cerealandmilk campaign. Winners mailing information will be gathered for the sole purpose of mailing their prize. Personal information will never be used in any other manner.